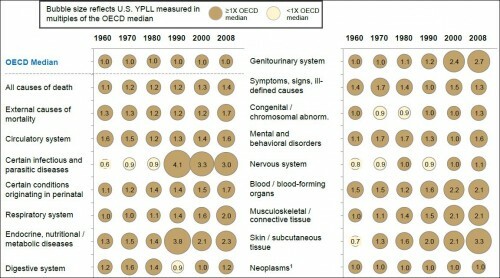 The chart shows years of potential life lost in the US as a multiple of the OECD median and over time. Values greater than 1 are bad (for the US). There are plenty of those. A value of exactly 1 would mean the US is at the OECD median. Below one would indicate we’re doing better. There’s not many of those. It’d be somewhat comforting if the US at least showed improvement over time. But, by and large, it does not. For many conditions, you can see the US pulling away from the OECD countries beginning in/around 1980 or 1990, as was the case for life expectancy shown above. Why? This is deeply unsatisfying, though it may be the best explanation available. Nevertheless, the sentence in bold is purely speculative. One must admit that it is plausible that fragmentation, incentives for procedures, and lack of organizational strategy could play a role in poor health outcomes in the US — they certainly don’t help — but the authors have also ticked off other factors. Which, if any, dominate? It’s completely unclear. If ‘all causes of death’ in the US are 10-20% higher than those of the OECD median from 1960 to 90 … how can the US life expectancy possibly stay on par with the OECD median for those 30 years? 10-20% worse is a LOT worse. If there is an un-gated version of the paper or a PDF I can look at via email I would gladly look into this myself. … I note that the mix of males and females over the years is a clear first line of inquiry (and may help explain the deterioration after 1990 as well), but I don’t have the data in front of me and it’s unlikely that it would change so drastically between 1960-1990 and then stop after 1990 to cause the deterioration we see there. 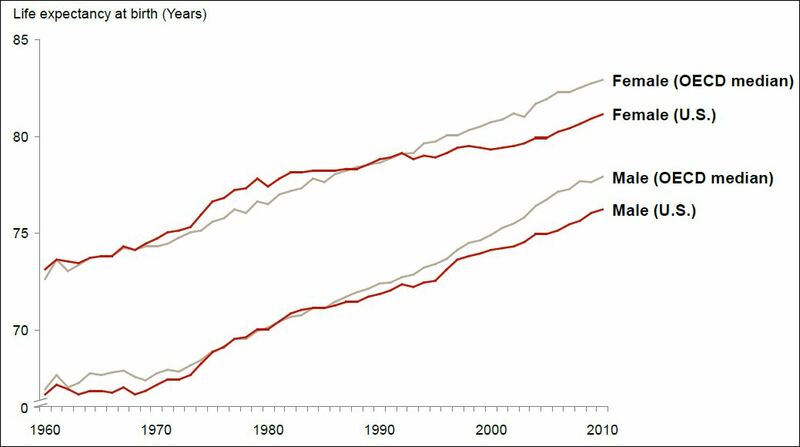 Note that this first chart is life expectancy. Most people die when they are old. Even if older people die at twice the rate of young people the LE will not differ by that much. If infant mortality was 20% higher in the US than in the OECD, and people only died when they were infants or at age 80, then we would see a 20% reduction in life expectancy. Otherwise the difference will be less than 20%. Work it out. The second chart is of years of productive life lost. It would also have a different pattern. I want to correct the second paragraph. The LE will always go down by less than the magnitude of the percent reduction in the P(dying). Suppose infant mortality was an implausible 10%, and 90% died at age 100, so LE was .1*0 + .9*100=90. A 20% increase in infant mortality (to 12%) would only reduce LE to 88 years, a ~2 percent reduction, not 20%. This percentage effect on LE will be even smaller if mortality at any age greater than 0 is reduced. Agreed, and thanks Randy. I went straight to P(death) on the the second chart and had not considered YPLL. I’ve never done that particular calculation though I think it seems fairly straightforward; I’ll read the PDF for more details!